The President of the United States is the head of state and head of government of the United States. The president leads the executive branch of the federal government and is the commander-in-chief of the United States armed forces. Article II of the U.S. Constitution vests the executive power of the United States in the president and charges him with the execution of federal law, alongside the responsibility of appointing federal executive, diplomatic, regulatory, and judicial officers, and concluding treaties with foreign powers, with the advice and consent of the Senate. Since the founding of the United States, the power of the president and the federal government have substantially grown and each modern president, despite possessing no formal legislative powers beyond signing or vetoing congressionally passed bills, is largely responsible for dictating the legislative agenda of his party and the foreign and domestic policy of the United States. The president is frequently described as the most powerful person in the world. The president is elected through the Electoral College to a four-year term. Since 1951, presidents have been limited to two terms by the Twenty-second Amendment. In all, 44 individuals have served 56 four-year terms. 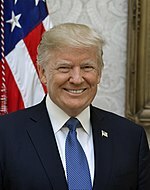 On January 20, 2017, Donald Trump became the forty-fifth and current President.